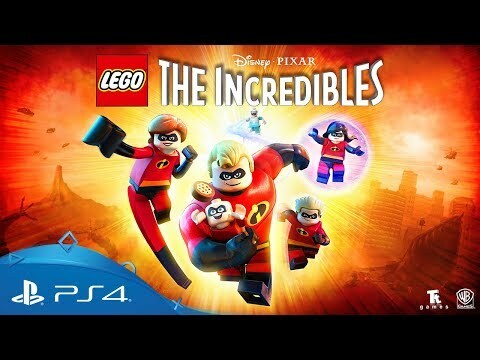 Take control of your favourite Incredibles characters and team-up to conquer crime in a uniquely LEGO-styled adventure. Become the hero of your miniature adventure and relive unforgettable scenes and action sequences from Disney Pixar’s, The Incredibles and The Incredibles 2 – all in LEGO’s inimitable style. Work together as the five incredible members of the Parr family in a variety of familiar locations, battling dangerous super-villains, recreating iconic moments and taking back the neighbourhood. Each hero brings their own unique abilities: use Elastigirl and transform into a sturdy bridge for the family to climb across or have Violet unleash her powers to dismantle laser grids for Dash to then race through. It’s only when this iconic team joins forces, that they become truly incredible! Combine the Parr family’s unique powers to build amazing LEGO structures and overcome puzzles. With Mr. Incredible’s unparalleled strength, Elastigirl’s flexibility and the rest of the gang’s awesome gifts, teamwork has never been so much fun. Modify your character’s appearance and abilities using a special ‘customiser’ themed to the diminutive, but bombastic fashion designer of the Incredibles’ iconic super hero outfits, Edna “E” Mode. Use your incredible powers to rid the city of crime, by completing action-packed side missions and defeating the iconic Super Villains that control the city districts of an open-hub world in a brand-new, free-play experience. Buy the complete game via PlayStation Store and download directly to your PS4 console - no hassle, no fuss.